Floryan Hotel is found in historically monumental building in Krakow's center by Florianska Gate and old type defence walls within walking distance from the main station and the market. 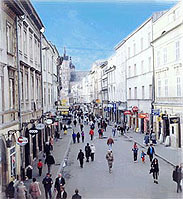 Florianska street has once been the property of the Royal family but now it serves the pedestrians for walking. We offer 54 sleeping spaces in 21 single, double rooms and suites. Each room is equipped with bathroom, a/c, TV Sat, radio, telephone and mini bar. Our restaurant serves dishes of Polish and European cuisine. Our hotels's facilities enable the organization of parties, banquets, business and family meetings. At our guests disposal is a conference room for 45 people equipped with audiovisual set. There is a car park for the guests. We participitate in the organization of the excursions to and outside the city. Our professionally trained staff will make your stay an enjoyable experience. The hotel accepts major credit cards. 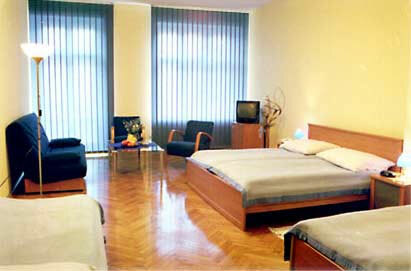 The hotel is located in the very center of the city, 500 m away from the main railway and bus station. The airport is 15 km away from the hotel. It takes about 15 minutes walk to reach the hotel from the main station. 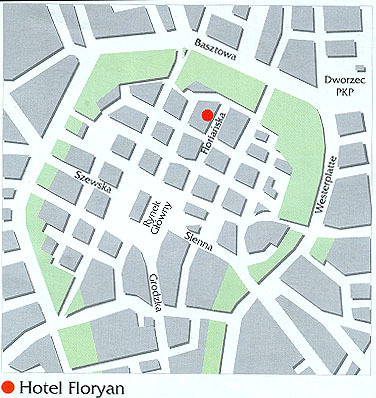 The hotel's location enables an easy access to the most attractive parts of the old Cracow such as museums, galleries, boutiques and antique shops, best restaurants and pubs.